I confess that I was shocked, but only for a brief moment. Of course, this was a valid critique. Why didn’t I think of this when I first saw that picture on Facebook? 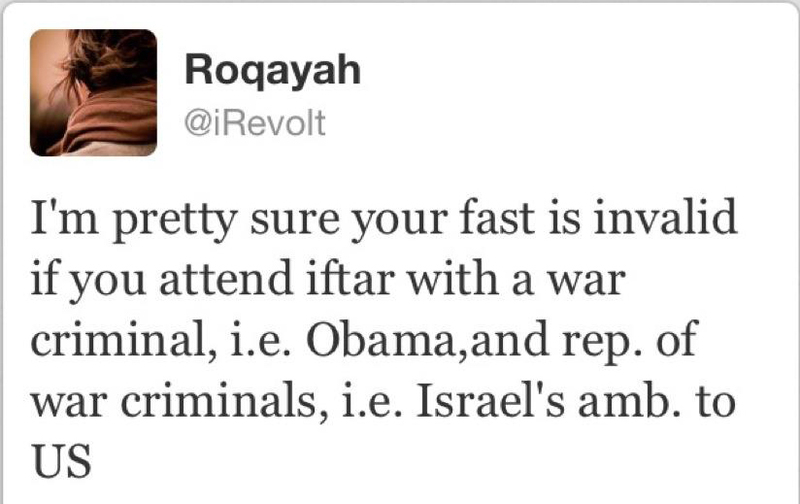 I felt a slight disappointment for not noticing the moral implications of attending a White House Iftar. I knew I had to atone for my complacency. Second, I decided that I would not say anything too negative or harsh about the folks who attended the White House Iftar. I knew some of them personally, and I knew they were not bad people by any stretch of the imagination. In fact, I knew that according to the usual criteria they were far better Muslims than I was. Clearly, I had no reason whatsoever to doubt their faith, and I was certainly not going to claim that I was somehow better than they. Third, I thought about their possible motives. Why would they do such a thing? Since I had already decided not to attribute any immoral or hypocritical motive to them, the only option was to assume that they didn’t know the full implications of their choice. I had to assume they were sincere. I must be as gentle and generous with them as possible, because they couldn’t possibly have known what they were doing. We all make mistakes while having the best of intentions. Fourth, I tried to put myself in the shoes of those who attended the White House Iftar. What would I had done if I was in their position? I decided that the only justification for visiting the President would be to speak the inconvenient truth to him. But that required courage. Did I have that courage? I thought about a recent experience in which I had failed to speak an inconvenient truth in front of people who were far less powerful than the U.S. President; I had remained quiet out of sheer cowardice. I decided that I didn’t have the courage needed to speak the inconvenient truth in a formal White House dinner, where such behavior would also have required breaking all etiquette and protocols, leading to rather unpleasant consequences. I knew I had no reason to demand that other folks must have the courage that I lacked. Fifth, if I didn’t have the courage to do the right thing, what would have been my options if I were actually invited to the White House? I could have attended the Iftar with the President, followed the required etiquette and protocols, and afterwards enjoyed a celebrity status among my peers. But this would have injured my soul and done serious violence to my conscience. Therefore, lacking the necessary courage to rock the boat but also wanting to preserve my soul and conscience, the only thing I could have done under those circumstances would have been to decline the invitation. Sorry, I would have said to the White House, but I can’t come to your dinner. 1. It was not a good idea for any conscientious American Muslim to attend an Iftar in Barack Obama’s White House during Ramadan 2012. The reasons for this should be obvious to anyone who has not been living in a cave, but I will list them anyway in my next blog post. 2. Without questioning the faith or sincerity of a fellow Muslim, the least that can be said about his/her participation in the above program is that it must have been the result either of ignorance or a lack of critical reflection. 3. Cowardice in itself is not a moral defect. If you lack the courage to speak the inconvenient truth in the face of the powerful, you can do the next best thing and avoid being in the company of the powerful. Excellent run-through and follow-up re: my tweet. There is no excuse for breaking fast in the company of two men, US President Obama and Israel’s ambassador to the US Oren; both men have blood on their hands and that any conscientious person could sit, laugh and dine on food whilst drones were buzzing over Pakistan, Somalia, Yemen et al. and Palestinians beings detained by the apartheid state of Israel is shameful. Thank you for the piece! Thanks for your response. I agree, obviously! Considering ourselves in footsteps of President Obama what his conscience and motivations are. ? Is dinner is well justified according to American values and I think that what they want to tell Muslims American values. Now American muslims in majority do not agree on it and it is explained well in above blog the variations and dynamics of consciousness and it is not just Muslims any human being may and will have same concerns. I’m for one who has same questions. Their may be a fine thin line of being apologetic at still being a moral and ethical person. So far, my points still stand; will await your next post. Well written so far, but not convincing. Good post. I appreciate the thoughtful approach by which you addressed the moral criticism of the White House Iftar attendees. The author of a criticism holds the moral high ground in his/her critique usually. I wonder if the criticism might be misdirected at an individual (the president) rather than an organization or system, in this case, the government, or more specifically its foreign policy of which we belong to. If the president is elected by the people to represent the will of the majority, then it is in fact the people you have the issue with. Sure, no one person has more authority than the president, but it is the compliance of your fellow countrymen that allow morally reprehensible acts to go unpunished (which I am assuming you are alluding to, I do live under many rocks). Engaging in a political exercise to establish a communication with the White house officials to make them aware of certain issues should by default be seen as a thoughtful and practical approach. Considering that is how this system is suppose to work or how the game is played. Of course nothing is perfect. A mosque burnt down a few days ago in America and hardly anyone knows about it. Will protesting a White house Iftar by declining the invite lead to some drastic policy change? I don’t understand how it requires more courage to speak with the President about an issue than to protest it? I would argue protesting requires more courage, because that would be the tougher way to get what you want.